“If you are working on something exciting that you really care about, you don’t have to be pushed. The vision pulls you” – Steve Jobs. In its best form a vision statement provides purpose and acts as the north star and guiding light for an organisation. It’s emotional and invites people to want to be part of it. Executed badly it is a convoluted meaningless phrase, created in an endless management buzzword bingo exercise. (Trust me, I have been there!). Recently I had been asked to help some teams in a large multi-national organisation to develop their team visions, clarifying their respective purpose to the rest of the organisation. In doing so, I had to deal with a couple of constraints. Firstly, we were very time constrained as we were confined to a tight meeting agenda; secondly, we were shooting for something that would sensibly fit on a T-shirt, as the teams were to have T-shirts printed explaining to the rest of the organisation what they were all about. IKEA’s: At Ikea our Vision is to create a better everyday life for the many people. DuPont’s: The vision of DuPont is to be the world’s most dynamic science company, creating sustainable solutions essential to a better, safer and healthier life for people everywhere. Lorain County Health and Dentistry’s: Lorain County Health and Dentistry passionately provides excellent healthcare to the people of our community, transforming the health and well-being of those in need. Segment a whiteboard, brown paper, or similar into three segments. Headline them “Do What?”, “For Whom?” and “To Achieve?” respectively (the group should know who they are). 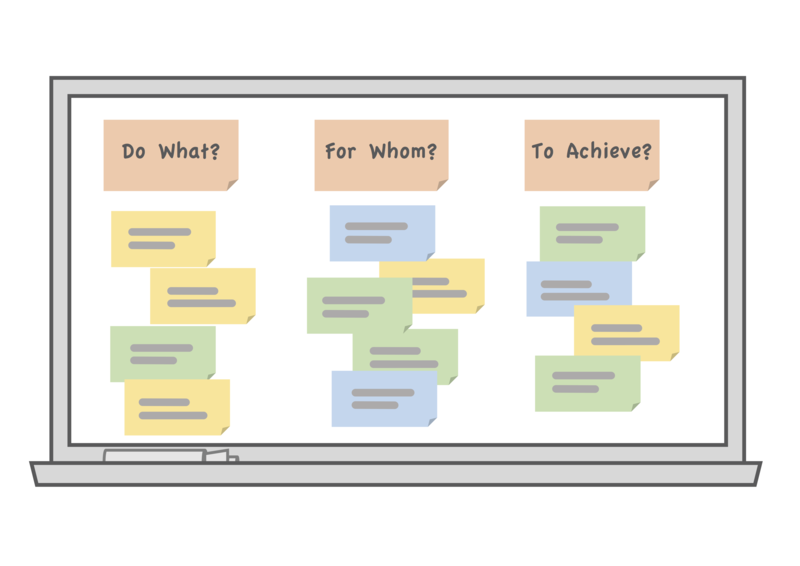 Ask the team’s members to individually write their thoughts for each of the headlines on sticky notes and have them stick them into the appropriate segment of the whiteboard (approx. 10-15 mins). As a group, spend another 15-20 mins clustering, discussing, and weeding out the resulting ideas. Remember, the output ultimately needs to fit on a T-shirt front! Use the “We, the X do what how for whom to achieve Y.” madlib to wordsmith the vision statement in another 10-15 mins of co-creation. Admittedly, we had the advantage of having earlier in the workshops toiled on the teams’ objectives and future contributions to the overall organisation. If you don’t have that groundwork, you may want to try Jurgen Appelo’s Management 3.0 Module “Meaning & Purpose” and have a “Work Expo” beforehand to establish a shared understanding of your team’s purpose. Also, the above is not a recipe for developing a – to my mind – equally important product vision. Roman Pichler’s: “8 Tips for Creating A Compelling Product Vision” would be a great starting point for this.